For extensive control over image-making, in-camera RAW (DNG) image processing is available as well as HDR shooting capabilities. For expediting control over the most oft-used functions of the K-500, both the front and rear e-dials are customizable and can be programmed to control an array of exposure settings and camera functions. For creatively modifying imagery in-camera, a variety of filters, scene modes, and auto modes are available to enhance the look and feel of imagery prior to post-processing. In addition to the range of automatic camera settings, traditional manual shooting modes are also available, such as program, shutter-priority, aperture-priority, sensitivity-priority, and manual. All of the K-500's technologies are housed within a polycarbonate-covered camera body that is supported by a stainless steel chassis. The design of the camera also allows the use of four AA batteries as its power source when used in conjunction with the included D-BH109 AA Battery Holder or, additionally, the optional D-LI109 lithium-ion battery pack can be used as a compact, rechargeable source of power. Included with the K-500 camera body is the smc PENTAX-DA L 18-55mm f/3.5-5.6 AL lens, which provides a 35mm-equivalent focal length of 27.0-82.5mm, covering wide-angle to portrait-length perspectives to suit working in a wide variety of situations. The lens construction integrates aspherical elements to help minimize chromatic aberration as well as improve image sharpness. Additionally, an SP (Super Protect) coating has been applied to elements to help repel dust, water, and grease from lens surfaces. The combination of the 16.3 megapixel APS-C-sized CMOS sensor and PRIME M image processor is able to produce high resolution imagery with notable quality and low-light sensitivity to ISO 51200. The speed afforded by the image processor enables continuous full-resolution shooting up to 6 fps, a maximum shutter speed of 1/6000th of a second, and also supports full HD 1080p video capture. The SAFOX IXi+ AF system utilizes 11 focus points, including nine cross-type sensors, to quickly and accurately acquire focus using a phase-detection method. With the inclusion of an AF-assist lamp and a diffraction lens, precise focusing is possible in a wide variety of lighting conditions using single-shot or continuous focusing modes. If working in manual focus, focus peaking is also available to highlight lines of contrast within the scene to offer a more objective means for determining critical focus. Pentax' sensor-shift type shake reduction image stabilization helps to minimize the appearance of camera shake when working with longer lenses in dim lighting conditions by up to the equivalent of three to four shutter speed steps. This helps to produce sharper overall imagery regardless of the lens in use. Also helping to balance imagery in-camera, a dual-axis electronic level is available to ensure consistent and straight horizons and plumb vertical lines. In addition to high quality still imagery, the K-500 also supports full HD video recording up to 1080p at 30 fps. Other frame rates available include 1080p at 24 fps; HD 720p at 60, 50, 30, 25, and 24 fps; and SD 480p at 30, 25, and 24 fps. Video is recorded in the high quality H.264 AVC/MPEG-4 format and can be saved in the Internet-friendly .MOV file format. Sound can be recorded along with the video using the built-in monaural microphone. The included standard zoom lens provides a 35mm-equivalent focal length range of 27.0-82.5mm to suit working in a wide variety of shooting scenarios. It features an SP coating to help repel dust, water, and grease on lens elements and a lightweight design to promote greater portability and use during travel. Its construction incorporates aspherical lens elements to help minimize chromatic aberrations throughout the zoom range and also contribute to producing overall sharper, clearer imagery. A 3.0" 921k-dot LCD monitor is available for live view monitoring, image playback, and menu navigation. The D-BH109 AA Battery Holder and four AA lithium batteries are included as this camera's power source. Additionally, the optional D-LI109 rechargeable lithium-ion battery can also be used. A 77-segment exposure metering system works to produce well-exposed and consistent results even in the most challenging lighting conditions. In-camera HDR shooting works to effectively expand the dynamic range of an image and achieve greater shadow and highlight detail. RAW (DNG) image processing is available in camera in order to quickly and easily convert images an Internet-friendly JPEG file format. Built-in pop-up flash with a guide no. of 39.4' at ISO 100 provides additional illumination for low-light settings and covers focal lengths as wide as 28mm. Programmable front and rear e-dials allow you to customize the controls available to quickly access without having to navigate through the camera's menu system. Enhanced creative modes, scene modes, filters, and auto picture modes allow you to easily modify and adjust the overall aesthetic appearance of imagery in-camera. Pentax K lens mount enables the use of a wide variety of both past and present K-mount lenses as well as compatibility with a variety of lens mount adapters. Eye-Fi memory card compatibility for wirelessly transferring imagery directly from the camera. Language support: English, French, German, Spanish, Portuguese, Italian, Dutch, Danish, Swedish, Finnish, Polish, Czech, Hungarian, Turkish, Greek, and Russian. Box Dimensions (LxWxH) 8.2 x 7.7 x 5.1"
K-500 Digital SLR Camera with 18-55mm f/3.5-5.6 Lens is rated 4.7 out of 5 by 25. Rated 5 out of 5 by JoBoo from Concerns Alleviated As a previous 35mm Pentax ME Super camera user, I was concerned as to what I could do with all of the Pentax lenses and accessories I had since the demise of 35mm film. I was glad to find out that Pentax had created an economical line of digital cameras that were capable of using earlier manufactured Pentax accessories. I may not be able to utilize all of the camera's automatic functions such as auto focus on some of my older lenses, but that is a small inconvenience since I was always used to manual focus previously. The results I get from the K-500 are fabulous. I could not ask for more. I am not a pro and I am VERY pleased with the overall operation of this camera. Rated 5 out of 5 by Sunshine Girl from Great for beginners! I've always loved photography and dreamed of buying a DSLR, but just couldn't afford it. This camera is a great choice for anyone who wants to take the next step and graduate from a point-and-shoot. It may take some reading and getting used to, but practice makes perfect! Buying a DSLR opens up lots of new photographic opportunites--astrophotography, fireworks, beautiful sunset shots, portraits, and all kinds of fun with long exposure (try drawing with sparklers at night with your friends/kids!). It's a solid choice for video as well (1080p @ 30fps vs 1080p @ 60fps in competing DSLRs) if you want to take videos of your tots playing or your vacation adventures. One thing to note: The USA version comes with 4 AA batteries, but it's possible to use a rechargable battery pack. The batteries included lasted me about a month, and I used my DSLR quite frequently, so be sure to buy some extras and keep them in your camera bag! Bottom line: You just can't beat the price. This camera certainly packs the most punch for the lowest price around. Rated 5 out of 5 by Rodrigo from Excelente cmara El firmware de la cmara posee funciones avanzadas (intervalmetro para time laps, histograma y sombras en live view, ISO 51200, 6 disparos por seg, etc...) Realmente es una muy buena opcin para este nivel de cmaras. Excelente resultado en imgenes. Ideal para los que nos iniciamos en la fotografa digital. Para mi ha sido la mejor opcin entras sus competidoras, por funcionaledades y precio. Esta versin posee pilas AA. Recomiendo comprar recargables de alto maH (2850). Rated 4 out of 5 by Mark from Learning process The fun of the camera is to move away from the automatic functions and learn to gain control over picture taking. However, it's a stretch to say that the 300 page manual is easy to learn, especially for the first time DSLR users for whom the camera is designed. I find it helpful to read articles in photo magazines/websites about how the authors handle different situations and then head back to the manual; it is amazing how much more sense the manual then makes. Rated 5 out of 5 by Fr-Eco from Excellent! This camera has just enough bells and whistles to be a good versatile camera. Nice-sized screen, intuitive placement of controls. Could use a wider-range lens but it's good enough for most shots. Even the video looks good. Rated 4 out of 5 by Wally1 from 2nd Pentax camera This is my second Pentax camera. I bought this to upgrade from the Kx. I have only had this one for a short time. So far I really like it. Nice big screen, plenty of speed and options. Rated 5 out of 5 by Ron the Retiree from Novice Beware Great Camera Big Manual I decided to graduate from a point and shoot digital camera to a DSLR. It arrived very quickly and upon opening it I found a 294 page manual that explained all the various adjustments I can make when using this camera. Before ordering a DSLR I had read some books on what can be done with them but didn't fully realize the complexity involved in capturing a picture. Luckily, it does have an auto mode which I am using now and each day I pick another feature to study and test. The pictures I get are much better than my old point and shoot camera produced and I'm sure as I become more familiar with additional features this camera will be a lot more versatile and fun to use. But beware, for the novice photographer these DSLR cameras require a lot of thought and study to make the most of their capabilities. Rated 5 out of 5 by Jose G from Excellent for its price. Very fast autofocus and excelent quality of images. I am trying to find something negative but at this moment nothing. Excellent camera. Does this come with printed manual or is it on the CD? The manual for the Pentax K-500 is included on a CD. Which strap can I use with this camera? Is there a battery grip available for the Pentax K500? There are currently no battery grips available for the Pentax K500. I have a vivitar 285 flash. Will this work on the Pentax K500? Yes, the Vivitar 285HV is compatible with the Penax K500. I have a k1000 with three lenses, will theses lens work with thek500 without additional mount? Your lenses from your Pentax K1000 will work on the K500 but with limited functionality. Would this be a camera recomended for someone new to photography? I literaly know nothing about photography, however I want a camera that takes great pictures. 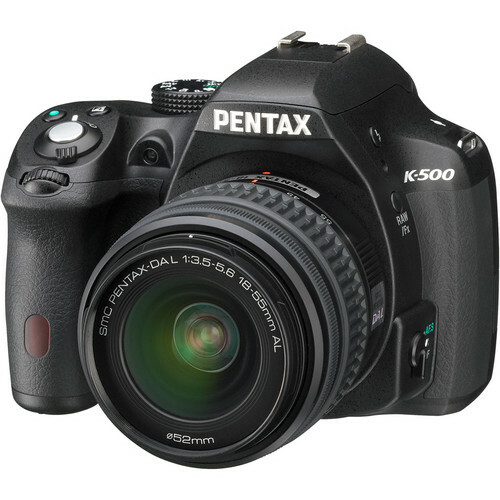 Yes, the Pentax K-500 is a good choice for a person new to photography. There is much room to grow with this camera, as you will be able to use full manual functions, as well as automatic modes. You will be able to experiment with low light shooting, HDR, HD video recording, and many other features while also getting great image quality. This camera runs on AA batteries. It comes with a first set of batteries, but they're not rechargeable. A. Can I buy a rechargeable lithium battery and charger instead of using the AA batteries?B. Can I buy a wifi memory card to download directly to iphone?